The pines along Bierstadt Lake appear to be sentinels watching the sunrise unfold before them. 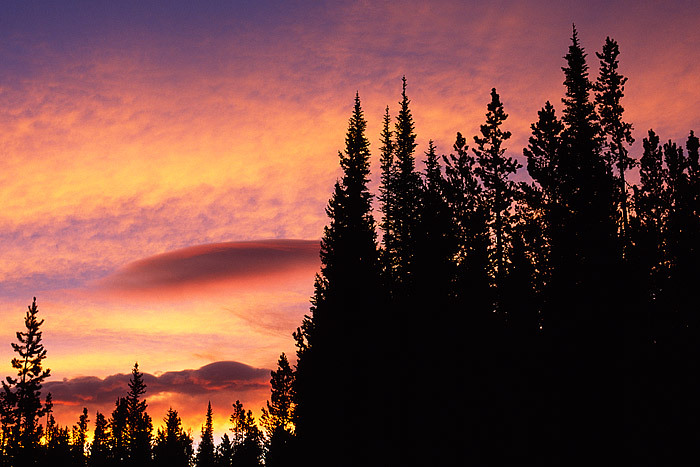 Lenticular clouds help to add drama to this sunrise. I had planned on hiking to Bierstadt lake to shoot a reflection of the Divide looking west. High winds prevented this, but they also helped to create these Lenticular clouds east of me which help to make this a memorable morning. Photo © copyright by Thomas Mangan.